The Wide Game Book Synopsis: On the advice of his wife, Paul Rice is making plans to attend his 10th year High School reunion. Returning to his boyhood home of Harmony, Indiana, he finds that he is still haunted by memories of that time-memories of Deidra, his first love, and memories of the Wide Game. It was ten years ago that Paul and his friends watched their day of fun become a race for their lives, a fight for their very souls. 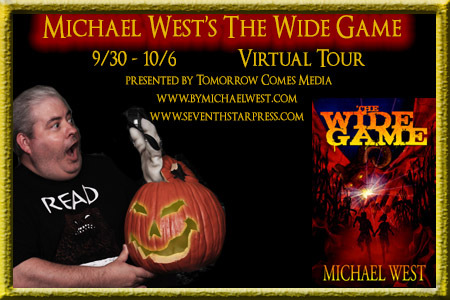 The Wide Game is one of the Harmony, Indiana horror novels from Michael West, which also include Cinema of Shadows and Spook House. On Amazon.com, you can find both print and e-book formats. LAC: Mr. West, thank you for this opportunity to ask you a few questions about the exciting reissue of your novel The Wide Game, which I found to be quite a page-turner. To get started, I’d like to know more about your decision to reissue this book now. One of the book’s strengths is a pervasive sense of nostalgia, particularly for “Gen X” and the class of 1988, to whom you dedicate the novel, and as the book’s description indicates, part of the action takes place at that class’s 10th reunion. So then: 1988, 1998, 2013. Why? MW: Well, the main reason is because the book went out of print and, as the first book in the Harmony, Indiana series, it was only logical for Seventh Star Press to want to make it available to fans of the series who could not find it, or who wanted it in eBook format. The fact that 2013 also happened to be the 25th Anniversary of the Class of 1988 was a happy coincidence. LAC: Let’s talk about corn. You acknowledge a debt to Stephen King through an allusion—you’ve got a character reading The Stand—and one of your most horrific images recalls that book. Nevertheless, perhaps because you actually know the region well, you manage to characterize the cornfields as both a standard feature of small-town Indiana life and a looming, potentially supernatural menace on the outskirts of standard human existence. Tell me the truth: how do you really feel about small towns and cornfield? MW: I think cornfields are inherently spooky places. The fact that something could be right there in the next row from you, and you wouldn’t see it until it was on top of you… *Shivers* That’s one reason why you see a lot of corn mazes pop up around Halloween. It is easy to get freaked out when you are lost there among the rows. LAC: Ever get lost in the rows yourself? 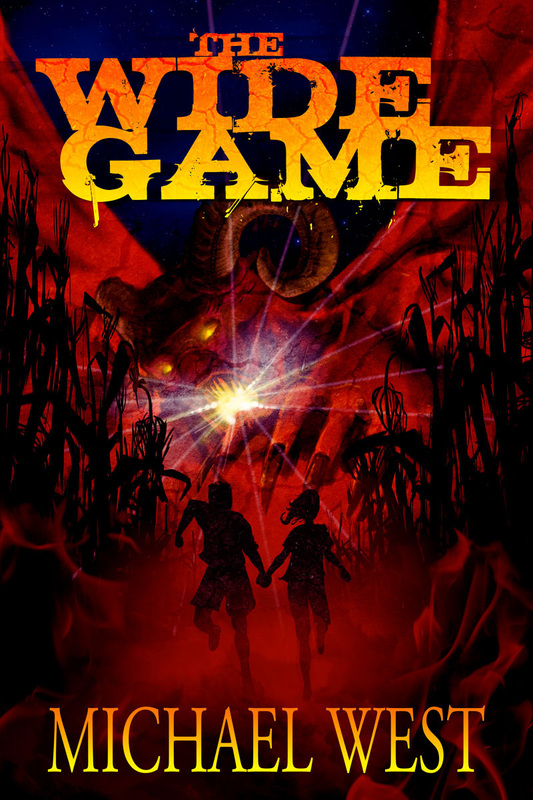 LAC: I don’t want to get into spoilers, but the gorgeous cover art at least suggests that something demonic lurks in the cornfields. Do the supernatural elements in this book link up with elements from your other Harmony, Indiana novels? Whether they do or not, can you tell me a little about the supernatural world glimpsed in The Wide Game? MW: Yes, let’s keep this a spoiler free zone. LOL The Harmony, Indiana novels—Wide Game, Cinema of Shadows, and Spook House—tend to focus on supernatural horror—ghosts, demons, etc. The town sits on what the Irish would call a “thin place,” an area where the barriers between our world and the next are stretched to the point of tearing. Or, if you’re a fan of Buffy the Vampire Slayer, you could just call it a hellmouth. At any rate, it allows all sorts of nasty things to seep into our reality. 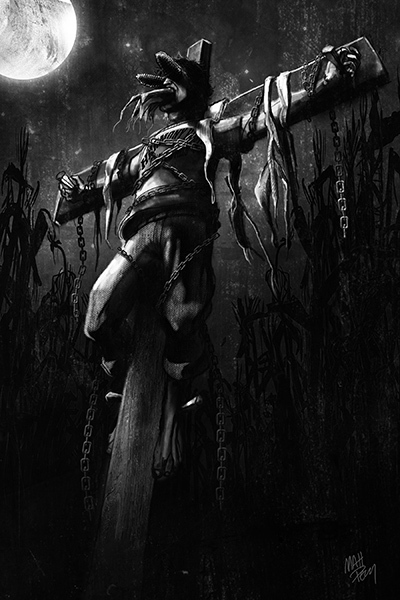 LAC: The prologue focuses on a conservative priest who encounters a murderer begging for confession. This religious motif recurs in important ways, suggesting a consistent moral or religious theme. Do you see your fiction as grounded in a particular belief system of your own, religious or otherwise? MW: Supernatural horror is about the eternal struggle between good and evil, and I think one of the best examples of that fight is in William Peter Blatty’s The Exorcist. I think when I set out to write this book I even described it as The Exorcist meets Lord of the Flies or something like that. I wanted to explore the concepts of Good and Evil, with a capital “G” and “E,” and how we choose between them. LAC: Other than a good time, what, if anything, do you hope readers take away from The Wide Game? MW: That’s the main thing I want them to have is a good time. I want to scare them, of course, to make them not feel safe alone in a room, and perhaps, make them not feel safe in that room with other people around. If they also find it thought-provoking, I’m OK with that too. LAC: Great horror writers deliver a mix of scares, and The Wide Game combines what Lovecraft calls cosmic fear (fear of the Big Unknown) with both fear of other people (bullies, people with hidden agendas, people who are different, etc.) and fear of oneself (in the right circumstances, what am I capable of?). What scares you most, and why? MW: I think fear of the unknown is what frightens me most. And one of the biggest unknowns out there is really yourself. What would you do in a given situation? How far would you go to protect the ones you love? And what would your life be like if you lost everything you hold dear? We’ll never really know the answers until we’re in those situations, and I think we all hope we’ll never find out. LAC: What do you think readers will find scariest about The Wide Game? MW: I’ve heard from a lot of readers over the years about this book, and everyone has something different they find frightening about it. I’m just so pleased that it has touched a chord with so many, and I hope that now, with this reissue, it will find an even larger audience. LAC: Where do you see the horrific side of your imagination taking you next? MW: Right now, I am working on Hades’ Disciples, the next chapter in my Urban Fantasy series, The Legacy of the Gods. I also have a short story, “Inner Goddess,” that will be appearing in the Book of the Dead anthology, which is now available for pre-order through Jurassic London. I’m really excited about that one. They’re actually mummifying the book. Crazy! LAC: On a final, related note: what’s one scary place, one sort of horror, where you don’t imagine yourself ever going? Why? MW: I don’t see myself ever venturing out into a jungle. Too many things with too many legs. If you’ve read any of my books, you know that those are one of my biggest fears.